Wednesday 17th November 2010Teachers thinking of setting up their own businesses? In a recent Enterprise Catalyst survey of over 100 teachers and lecturing staff across the UK over 25% believe that setting up and running their own business sounds like a good idea. What does this mean - are teachers seriously thinking about business start-up as theor potential next career move? Monday 15th November 2010What impact will Global Entrepreneurship Week have on Enterprise education? How effective do you think Global Entrepreneurship Week will be? How can the Enterprise Catalyst help? Monday 01st November 2010Are the Apprentices entrepreneurs or employees? The Apprentices are employees - or at most prospective employees. Maybe when the fail to get a job with Lord Alan they will become entrepreneurs - but at this point in time (November 1st 2010) they are prospective employees! 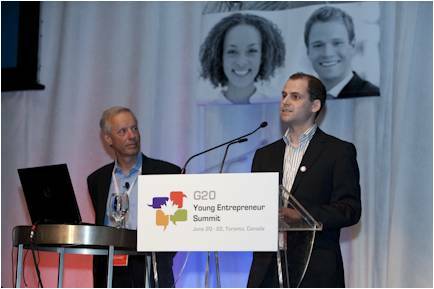 Philip Kerr talks about his role as one of five UK delegates at the G20 Young Entrepreneur Summit in Toronto, June 20-22, 2010. Welcome to our new blog which has just been launched. We look forward to hearing lots of news and views regarding enterprise education from all of our users as well as keeping you up to date with new developments and interesting links.